The Appalachian State Mountaineers football team is the college football team at Appalachian State University in Boone, North Carolina. The Mountaineers have competed in the Football Bowl Subdivision (FBS) and the Sun Belt Conference since 2014. Appalachian plays its home games in Kidd Brewer Stadium, named after former head coach Kidd Brewer, whose 1937 squad was unbeaten and unscored upon during the regular season. The Mountaineers competed in the Football Championship Subdivision (FCS) from its founding in 1978 to 2013. They won three straight national championships from 2005 to 2007, the first FCS team to do so since the playoffs began in 1978. They were also the first Division I program to win three consecutive national championships since Army accomplished the feat from 1944 to 1946, and the first Division I school in the modern era to claim three straight undisputed national titles. Appalachian became the first FCS team to receive votes in the final Associated Press (AP) college football poll on January 8, 2008. The Mountaineers received five points in the poll. Through its history, the App State football program has won over 550 games, claimed three national championships and appeared in the Division-I FCS playoffs 20 times. The Mountaineers have 19 conference championships and have one of the nation's best home field advantages. The program also has one Walter Payton Award winner, Armanti Edwards, who was the first player to win the award in back-to-back years (2008, 2009). On October 21, 2018, the Mountaineers became ranked in the Associated Press Top 25 Poll, ranking at number 25. This was the team's first time being nationally ranked. Appalachian State began playing organized football in 1928. The coach that first year was Graydon Eggers. The Mountaineers competed as an independent before joining the National Association of Intercollegiate Athletics (NAIA) North State Conference as a charter member in 1931. Kidd Brewer was the head coach of the Mountaineers from 1935–38, leading the team to two postseason bowl games. Brewer's 1937 squad is best remembered for going unbeaten and unscored upon during the regular season, outscoring opponents 206–0 before losing a postseason game to the Golden Eagles, 7–0. Appalachian found continued success under coach E. C. Duggins (1947–50 and 1952–55). During Duggins' eight years as coach, the Mountaineers claimed three more North State Conference championships and played in seven bowl games. The Mountaineers again competed as an independent from 1968–71 before joining the Southern Conference. Jim Duncan served as Appalachian State's head coach from 1960–1964, compiling a 31–15–2 record. Duncan was succeeded by Carl Messere, who compiled a 34–26–1 record from 1965–1970. Wofford head coach Jim Brakefield was hired as Appalachian State's head football coach in 1971. He led the Mountaineers into the Southern Conference in his first season. Brakefield led the Mountaineers to three losing seasons in four years en route to a 47–48–4 record at Appalachian State, however, a 3–8 campaign in 1979 resulted in his dismissal. However, Brakefield's 1975 team won impressive victories over Wake Forest (19–17) and South Carolina (35–34) in 1979. Mike Working served as the 16th head football coach in Appalachian State football history from 1980–1982. Under Working, the Mountaineers compiled a record of 13–18–2 and never were able to sustain consistency. Working was fired following back to back seven-loss seasons in 1981 and 1982. 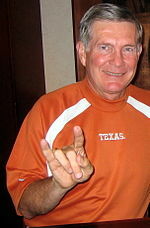 Legendary coach Mack Brown was hired as Appalachian State's head coach in 1983. Brown, who had previously served as LSU's quarterbacks coach, led Appalachian State to a 6–5 record in what would be his only season. In December 1983, he was seriously considered for the head coaching position at LSU which had been vacated after Jerry Stovall was fired, but the position instead went to Miami Dolphins defensive coordinator Bill Arnsparger. However, Brown chose to leave Appalachian State to accept the position of offensive coordinator at Oklahoma under head coach Barry Switzer. Following Brown's departure, Appalachian State promoted assistant coach Sparky Woods to head coach. Appalachian State won the first of nine Southern Conference championships in 1986 under Woods, who also led the Mountaineers into the playoffs for the first time that year. Another conference championship and playoff appearance followed in 1987. Woods won the Wallace Wade Coach of the Year Award three straight years in 1985, 1986, and 1987, becoming the only coach in conference history to do so. Woods, who compiled a 38–19–2 record at Appalachian State, left to accept the head coaching position at South Carolina after five seasons. Arkansas assistant coach Jerry Moore was hired as the Mountaineer's 19th coach in 1989. Moore is the winningest coach in conference history, and under his leadership the Mountaineers have won seven conference championships. In addition, the Mountaineers have posted nineteen winning campaigns to go with one losing season during his tenure, allowing Moore to claim Southern Conference Coach of the Year honors a record six times. He was also the 2006 recipient of the Eddie Robinson Award, presented to the division's most outstanding coach. Under the stewardship of Moore, players such as two-time Buck Buchanan Award winner Dexter Coakley have gone on to play in the National Football League. Appalachian State became the first team since the playoffs began in 1978 to win three straight national titles in 2005, 2006, and 2007, and the first team to accomplish the feat since Army in 1944, 1945, and 1946. They are also the first Division I school in modern times to claim three straight undisputed national titles. On September 1, 2007, in what was hailed as one of the biggest upsets in United States sports history, the Mountaineers shocked the fifth-ranked Michigan Wolverines, 34–32. Most people predicted that Michigan was going to win by a large margin—in fact, the unofficial odds were that Michigan was going to win by 33 points. The win helped Applachian State become the first FCS team to ever receive votes in the final Associated Press (AP) college football poll on January 8, 2008. The Mountaineers received five points in the poll, tying South Florida for 34th. The conclusion of the 2008 season saw quarterback Armanti Edwards win Appalachian's first Walter Payton Award, presented annually to the most outstanding offensive player. On December 2, 2012, after a first-round home playoff loss to Illinois State, athletics director Charlie Cobb announced that Moore would not return for the 2013 season. According to a press release issued by the ASU athletic department, Cobb stated that he and Moore agreed after the end of the 2011 season that the 2012 season would be Moore's last as head coach, but chose not to make an announcement until that time. However, several days later, Moore claimed that there had been a communication gap, and that he had wanted to coach for one more season (i.e., 2013). On December 14, 2012, Scott Satterfield was named head coach of the Appalachian State football program. Satterfield had spent 15 seasons as an assistant in the Mountaineers program. As the offensive coordinator, he was responsible for much of the program's success. In 2013, the Mountaineers began a two-year transition from the FCS to college football's premier FBS level. Because of this, the program was declared ineligible for FCS postseason play. Appalachian State's first year of FBS play would come in 2014 as a member of the Sun Belt Conference. However, per NCAA rules, the Mountaineers would not be eligible for the FBS post-season until 2015. The first game of App State's inaugural FBS season was a rematch of the 2007 Appalachian State vs. Michigan football game. However, this time, the Michigan Wolverines won in a 52–14 blowout. The Mountaineers had their first home game of the season the following week in a win against Campbell. App State would lose its next four contests. After a 1–5 start, the Mountaineers rallied and won the final six games of their 2014 season. The team finished 7–5 overall (6–2 Sun) with a third place conference finish in their first season as a member of the Sun Belt Conference. Appalachian State opened the 2015 season with a 49–0 pounding of Howard before losing to Clemson. After their 1–1 start, the Mountaineers won six straight but fell short to the eventual Sun Belt champion, Arkansas State, on November 5. The team rallied, finished the regular season 10–2 and received a bid to play in the Camellia Bowl against an 8–4 Ohio. The Mountaineers overcame their opposition 31–29 becoming the first team in Sun Belt history to win eleven games in one season. This win was also historic as it marked the first time a former FCS team won a bowl game in their first season of bowl eligibility. On November 24, 2015 Miami confirmed rumors they have scheduled a home-and-home series with Appalachian State. The first game was played in Kidd Brewer Stadium on September 17, 2016, and marked the Mountaineers' first home game against a power five opponent in modern history. The second game will be played in Sun Life Stadium on September 11, 2021. In 2016, the Mountaineers finished with a 10–3 record. In 2018, Appalachian State was ranked in the FBS for the first time in its history after starting out 5–1 in the 2018 season; its only recorded loss was to Penn State in an overtime game. They would promptly lose their next game and their ranking. The Mountaineers would end the 2018 season as Sun Belt Conference Champions. 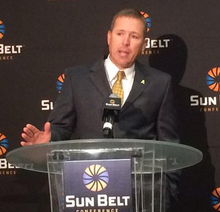 Satterfield would be named Sun Belt Conference Coach of the Year. It was the Mountaineers' 3rd Conference championship in a row and their first outright championship in the inaugural Sun Belt Championship game hosted in Boone on December 1st, 2018. On December 4th, 2018 Scott Satterfield was confirmed to be the next head coach at The University of Louisville Cardinal Football program in the ACC. Assistant Head Coach Mark Ivey would be named interim Head Coach and would go on to coach the Mountaineers for the 2018 R+L Carriers New Orleans Bowl win over Middle Tennessee State University Blue Raiders (43-13) December 15th, 2018. Ivey would not be retained as head coach of the Mountaineers The Mountaineers ended their season 11-2, 4-peat Bowl Game champs, and 3-peat conference champs. Eliah Drinkwitz was hired by Appalachian State on December 13, 2018. He was previously the offensive coordinator for NC State. Appalachian has won three national championships in the NCAA Division I Football Championship Subdivision, at the time, the highest division in college football to hold a playoff tournament to determine its champion. The Mountaineers became the fifth program in FCS history to reach the national title game three straight years joining Eastern Kentucky (1979–82), Georgia Southern (1988–90 and 1998–2000), Marshall (1991–93) and Youngstown State (1991–94). Appalachian also had a thirteen-game postseason winning streak, a record for consecutive wins in contiguous years that ended with a loss to Richmond in 2008. Appalachian State has won 21 conference titles, 15 outright and six shared. Before leaving the Southern Conference in 2014, the Mountaineers had won 10 conference titles, placing them second in the league's history. The Furman Paladins lead the SoCon with 12 championships. NCAA records list the date of the first Pythian Bowl as "11-26-1949", which is inconsistent with contemporary newspaper reports. Note: Appalachian did not field a team in 1943 or 1944. Known as the Battle for the Old Mountain Jug, Appalachian State played Western Carolina in a regional rivalry game from 1932–2013. The only years in that period in which the game was not played were 1942 to 1945, during U.S. involvement in World War II. In 1976, a traveling trophy known as the Old Mountain Jug was created from an old moonshine jug. Appalachian's record in games played is 59–18–1, and 31–7 in the Jug era. The Mountaineers currently hold the trophy, having won each of the last nine games (2005–2013) and 26 of the last 28.[when?] No further games in the rivalry are scheduled following Appalachian's move to the Sun Belt Conference. College Field was the home of Appalachian football from 1928 to 1961. Located at the future site of Rankin Hall and Edwin Duncan Hall, the stadium was replaced by Kidd Brewer Stadium in 1962. Opened in 1962, Kidd Brewer Stadium was originally named Conrad Stadium after former university trustee and R.J. Reynolds executive William J. Conrad. The stadium was renamed in 1988 for Kidd Brewer who coached the Mountaineers from 1935–38. Nicknamed "The Rock", it sits at an elevation of 3,280 feet (1,000 m) but is measured at 3,333 feet (1,016 m) for NCAA qualifications. The stadium was the first venue in either North or South Carolina to install artificial turf. On October 3, 1970, the Mountaineers and Elon Fightin' Christians staged the first ever game played on turf in the Carolinas. After a 2002 First Round I-AA playoff loss to Maine, Appalachian compiled a 30-game unbeaten streak at Kidd Brewer Stadium that ended on October 20, 2007. The Mountaineers led the FCS in average attendance throughout the 2007, 2008, and 2010 seasons. Kidd Brewer saw average crowds of 24,219, 25,161 and 25,715 respectively. Completed in 2009, the stadium has seen extensive renovations as part of a $50 million facilities improvement campaign. An upper deck with additional seating for 4,400 was added to the east (visitor) stands prior to the 2008 season. Additional restrooms and concessions have been added. Most significantly, rising behind the west (home) stands and replacing the former pressbox facilities, the 100,000 square feet (9,300 m2) KBS Complex was completed before the start of the 2009 season. The KBS Complex includes new stadium entrance plaza, strength and conditioning rooms, a hydrotherapy room, locker rooms, athletics offices, stadium suites and club seating. On February 28, 2017, the Appalachian State athletics office announced a construction project to increase the size of the video display board in Kidd-Brewer Stadium. The proposed video board will be approximately 2,500 square feet (50' x 90'), with LED display, 13HD technology and a Daktronics custom audio system integrated into the video board. The cost of the project is estimated to be approximately $60 million and be completed prior to the 2017 season. The Miracle on the Mountain took place at Kidd Brewer Stadium on October 12, 2002, and was selected as the "ABC Sports Radio Call of the Year." A low scoring affair, the Paladins elected to attempt a two-point conversion after scoring the go-ahead touchdown with 7 seconds left in the game. Leading 15–14, Furman quarterback Billy Napier's pass was intercepted by Josh Jeffries at the 4-yard line. He lateraled the ball to Derrick Black who returned it for a score giving the Mountaineers a 16–15 win. On September 1, 2007, the Appalachian State football team traveled to Ann Arbor to play their season opener at the University of Michigan. A sellout crowd of over 109,000 fans packed Michigan Stadium, becoming the largest crowd to ever witness an ASU football game. Appalachian State beat Michigan 34–32 and became the first Division I-AA football team to defeat a Division I-A team ranked in the AP poll. This victory was seen by some analysts to be one of the greatest upsets in NCAA football history. Following the win, they were featured on the cover of the following week's issue of Sports Illustrated. On August 30, 2008, Appalachian State opened its football season at Tiger Stadium in Baton Rouge, Louisiana against NCAA Division I FBS (formerly Division I-A) defending national champion Louisiana State University. The game, which was broadcast on ESPN Classic, was the first ever between defending FBS and FCS National Championship teams. The game against the Mountaineers saw the Tigers claim an early lead and victory by a score of 41–13. On December 1, 2018, Appalachian State played in the first inaugural Sun Belt Conference Championship Game at Kidd Brewer Stadium in Boone, North Carolina, against NCAA Division I FBS opponent University of Louisiana at Lafayette. This game, which was broadcast on ESPN, was the first ever time in Sun Belt Conference history that the conference held a championship game. The game against the Ragin' Cajuns saw the Mountaineers come out on top 30–19. This gave the Mountaineers a berth to the New Orleans Bowl on December 15, 2018. ^ "University Colors :: University Communications Toolbox :: Appalachian State University". Vt.uc.appstate.edu. Retrieved March 28, 2016. ^ "Appalachian State: About the University". Appalachian State University. Archived from the original on 5 December 2008. Retrieved 2008-12-09. ^ Bowman, Tommy (March 25, 2013). "Appalachian State to leave SoCon for Sun Belt". Winston Salem Journal. ^ a b c d e f Flynn, Mike (2008). 2008 Appalachian Football: Kidd Brewer Stadium (PDF). Appalachian Sports Information. p. 194. ^ Appalachian Sports Information (2007-12-14). "Thrice is Nice: Apps Rout Delaware For Third-Straight National Title". AppStateSports. ^ Army's three consecutive national titles were all split championships. The only other Division I school to claim three consecutive national titles in the 20th century was Minnesota, with a consensus title in 1934 and split titles in 1935 and 1936. The last school with three consecutive undisputed national titles in Division I or its predecessors was Yale, retroactively designated by the Helms Athletic Foundation as national champions in 1886 through 1888. For sourced lists of past national champions in Division I FBS and its predecessors, see College football national championships in NCAA Division I FBS. ^ Appalachian Sports Information (2008-01-08). "Mountaineer Football Notebook: ASU Receives Votes in Final AP Poll". AppStateSports. ^ "2007 NCAA Football Rankings – Final (Jan. 8)". ESPN. Associated Press. 2008-01-08. ^ "App. State's Armanti Edwards wins Walter Payton award". ESPN. Associated Press. 2008-12-19. Archived from the original on 7 February 2009. Retrieved 2009-03-01. ^ AP (October 21, 2018). "Clemson up to No. 2 in AP poll as Ohio State falls to No. 11; App State breaks in". ESPN. ^ a b c d Flynn, Mike (2008). 2008 Appalachian Football: Coaching Records (PDF). Appalachian Sports Information. p. 182. ^ Coker College (2007-01-30). "CVAC to change name to Conference Carolinas". Coker Cobras. Archived from the original on 2007-04-23. ^ Murphy, Austin (September 10, 2007). "Silence in the Big House". Sports Illustrated. Archived from the original on October 12, 2013. ^ Patterson, Chip (October 23, 2015). "Get used to seeing Appalachian State, the new Sun Belt frontrunners". CBS Sports. ^ Lage, Larry (August 30, 2014). "Michigan routs Appalachian State 52–14 in rematch". Associated Press. ^ Flynn, Mike (2008). 2008 Appalachian Football: Honors and Awards (PDF). Appalachian Sports Information. pp. 158–59. ^ Flynn, Mike (2008). 2008 Appalachian Football: Coaches and Staff (PDF). Appalachian Sports Information. p. 34. ^ Appalachian Sports Information (2008-11-25). "Mountaineers Sweep SoCon's Major Awards, Place 14 on All-Conference Teams". GoASU. ^ "Jerry Moore wins 2006 Eddie Robinson Award". The Sports Network. Archived from the original on 2011-04-04. Retrieved 2008-12-24. ^ a b Elizabeth A. Davis (2005-12-16). "Appalachian State takes fumble and I-AA title from N. Iowa". USA Today. ^ a b "Appalachian State defeats UMass to repeat as I-AA champs". ESPN. 2006-12-15. ^ a b "Months after Michigan upset, Appalachian State completes FCS 3-peat". ESPN. 2007-12-14. ^ Appalachian Sports Information (2007-12-14). "Thrice is Nice: Apps Rout Delaware For Third-Straight National Title". GoASU. ^ Army's three consecutive national titles were all split championships. The only other Division I school to claim three consecutive national titles in the 20th century was Minnesota, with a consensus title in 1934 and split titles in 1935 and 1936. The last school with three consecutive undisputed national titles in Division I or its predecessors was Yale, retroactively designated by the Helms Athletic Foundation as national champions in 1886 through 1888. For sourced lists of past national champions in Division I FBS and its predecessors, see NCAA Division I FBS National Football Championship. ^ Dan Wetzel (2007-09-01). "Hail to the victors". Yahoo! Sports. Retrieved 2007-09-01. ^ Stewart Mandel (2007-09-01). "The Mother of All Upsets". CNNSI. Retrieved 2007-09-01. ^ "Gigantic spreads: 5 memorable Michigan games where the Wolverines were massive favorites". mLive. Retrieved 23 May 2018. ^ Appalachian Sports Information (2008-01-08). "Mountaineer Football Notebook: ASU Receives Votes in Final AP Poll". GoASU. ^ "2007 NCAA Football Rankings – Final (January 8)". ESPN. Associated Press. 2008-01-08. ^ "Armanti Edwards wins 2008 Walter Payton Award". The Sports Network. 2007-12-18. Archived from the original on 2011-05-25. Retrieved 2008-12-21. ^ "Jerry Moore Tenure Comes to an End at Appalachian" (Press release). Appalachian Sports Information. December 2, 2012. Retrieved December 18, 2012. ^ ASU's Moore tries to defend position, Winston-Salem Journal. Retrieved December 6, 2012. ^ "AP Top 25: Clemson back to 2; App State ranked for 1st time". USA Today. Retrieved 2018-10-24. ^ "Sun Belt Announces 2018 Football Postseason All-Conference, Individual Awards". sunbeltsports.org. Retrieved 2019-02-14. ^ "Louisville names App State's Satterfield coach". ESPN.com. 2018-12-04. Retrieved 2019-02-14. ^ Joyce, Ethan. "App Trail: Mark Ivey named App State interim head coach". Winston-Salem Journal. Retrieved 2019-02-14. ^ Journal, Ethan Joyce Winston-Salem. "App State's Mark Ivey ruled out for football program's head coaching vacancy". Winston-Salem Journal. Retrieved 2019-02-14. ^ "2018 Appalachian State Mountaineers Schedule and Results". College Football at Sports-Reference.com. Retrieved 2019-02-14. ^ Journal, Ethan Joyce Winston-Salem. "App State hires N.C. State offensive coordinator Eliah Drinkwitz as head football coach". Winston-Salem Journal. Retrieved 2019-02-14. ^ "NC State taps BSU OC Drinkwitz to lead offense". ESPN.com. 2016-01-11. Retrieved 2019-02-14. ^ Appalachian Sports Information (2007-12-07). "Back to Chattanooga: Edwards' Record Performance Punches ASU's Ticket To Third-Straight Title Game". AppStateSports. ^ Appalachian Sports Information (2007-12-14). "National Championship Gameday Is Here". AppStateSports. ^ "Turnovers Doom ASU in Season-Ending Loss". Southern Conference. 2008-12-06. Retrieved 2008-12-24. ^ "Appalachian State vs. LSU". Associated Press. ^ a b "BOWL/ALL STAR GAME RECORDS" (PDF). NCAA. 2016. Retrieved January 7, 2017. ^ "Pythian Bowl Slated Today At Salisbury". Asheville Citizen-Times. Asheville, North Carolina. Associated Press. December 10, 1949. Retrieved March 29, 2017 – via newspapers.com. ^ "Appalachian State Tops Catawba, 21–7". The Courier-Journal. Louisville, Kentucky. Associated Press. December 11, 1949. Retrieved March 29, 2017 – via newspapers.com. ^ Appalachian Sports Information (2008-11-22). "No. 2 ASU Looks to Close Out Perfect SoCon Season at Archrival WCU". AppStateSports. Retrieved 2008-11-24. ^ Friley, Kevin (2019-03-04). "What Comes After the Old Mountain Jug: Future Opponents and In-State Rivalries". App State Tailgate. Retrieved 2019-04-18. ^ "Late Rally Falls Short, Home Winning Streak Ends with 38–35 Loss to GSU". AppStateSports. 2007-10-20. ^ "2007 NCAA Average Attendance Report" (PDF). NCAA. 2008-01-08. ^ "2008 NCAA Average Attendance Report" (PDF). NCAA. 2009-01-09. ^ a b Appalachian Sports Information (2008-07-28). "Facilities Enhancement Construction Progress". AppStateSports. ^ Appalachian Sports Information. "Appalachian Athletics Facilities Enhancement Plan". AppStateSports. Retrieved 2008-06-28. ^ "New video display board in Kidd-Brewer Stadium". AppStateSports.com. 2017. Retrieved March 1, 2017. ^ Flynn, Mike (2008). 2008 Appalachian Football: Most Memorable Games (PDF). Appalachian Sports Information. p. 168. ^ Appalachian State (2002-10-12). The Miracle on the Mountain. Retrieved 2008-01-06. ^ "Blocked field goal secures Appalachian State's upset of Michigan". ESPN. Associated Press. 2007-09-01. Archived from the original on 4 September 2007. Retrieved 2007-09-01. ^ Pat Forde (2007-09-01). "Appalachian State earns role as conquering hero". ESPN. ^ Mark Schlabach (2007-09-01). "Hundreds of Mountaineers fans celebrate upset win". ESPN. ^ Stewart Mandel (2007-09-01). "The Mother of All Upsets". CNNSI. ^ Dan Wetzel (2007-09-01). "Hail to the victors". Yahoo! Sports. ^ Sports Network (2008-12-18). "Armanti Edwards wins 2008 Walter Payton Award". The Sports Network. Archived from the original on 2011-04-04. ^ "AFCA Announces its 2007 National Coaches of the Year". AFCA. 2008-01-09. Archived from the original on 2010-12-05. ^ Appalachian Sports Information (2006-09-21). "Appalachian to Retire Hand's No. 71 as Part of Homecoming Festivities". AppStateSports. ^ Flynn, Mike (2008). 2008 Appalachian Football: Honors and Awards (PDF). Appalachian Sports Information. p. 158. ^ NCAA (2005-01-08). "IAA National Player Report All-Purpose Yards". ^ Appalachian Sports Information (2014-05-22). "Moore Selected for College Football Hall of Fame". AppStateSports. Retrieved 2014-05-22. ^ "Appalachian State Mountaineers Football Schedules and Future Schedules". fbschedules.com. Retrieved 2018-02-06.